Chateau Jean Faux is located near Cotes de Castillon in the village of Sainte Radegonde. The property dates back to the 18th century. The 12 hectares of vineyards of Chateau Jean Faux are planted to 80% Merlot and 20% Cabernet Franc for the red wine. The vines are on average 25 years of age. 2 hectares of vines are reserved for white Bordeaux wine grapes, which are planted to 80% Sauvignon Blanc and 20% Semillon. 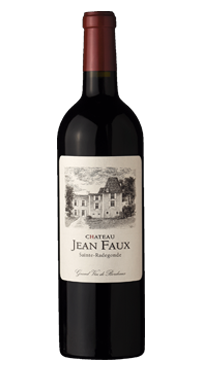 The terroir of Chateau Jean Faux is clay and limestone soils. The property has been organic since 2011 and as of 2015 is certified biodynamic. Vinified in temperature controlled stainless steel and concrete vats that range in size from 40 hectoliters to 80 hectoliters. The grapes are whole berry fermented. Malolactic fermentation takes place in barrel. The wine is then aged in 40% new and 60% two year old French oak barrels for 12 to 14 months.